How we built a plane and our journey to see the country. Flying to Key West – Looking for Warmer Weather! Cajun Christmas Flight to Natchitoches, LA with a SWEET Ending! We had a great trip to the AOPA regional fly-in at the Jack Edwards Airport in Gulf Shores, AL. Lots of airplanes, great food and meeting with friends! Check out the video and please subscribe here! Here is part 2 about our trip to Petiti Jean Mountain, AR for the annual RV Gathering. Ever seen airplanes popping balloons? CHECK IT OUT! Great Day Fishing on the White River in North Arkansas! Great day fly fishing for rainbow trout on the White River near Cotter, Arkansas starting at the Rim Shoals access. Beautiful Saturday to Fly… Just a short post to show the video we made while at the Copiah County, MS Fly-In a few weeks ago. We had a GREAT turn out with some really nice planes! Good food, FAA Wings credit, cheap gas, and I found someone to buy my old magnetos… perfect day! Please follow us on Facebook or “the” Twitter and keep the shiny side up! Overall… our trip to Oshkosh & Airventure 2013 went very well. The weather could NOT HAVE BEEN BETTER! Morning temps in the 50’s and mid afternoon highs in the 70’s made it really easy to sleep in the tent. We had very little rain and only one big gust of wind… No tents were harmed in the making of this adventure! Attendance… seemed on par with last year and was confirmed this week by EAA. Over 10,000 planes made it to Oshkosh for the week. RV’s were well represented in homebuilt camping as you can see by the panoramic photo below… this was taken from the wing of our RV9A (click for larger view). Show Changes and Cool Stuff… I think were, for the most part, good. I liked the new airshow format, the $2 water everywhere, the new food vendors with a much larger variety and TWO night airshows. The biggest thing missing this year was ALL military aircraft. We had no C-17’s or A-10’s on static display or the usual daily flybys from F-18 Hornets or F-22 Raptors. Thank goodness there is one person alive that can afford to privately own and operate a Harrier Jump Jet so that we can get our fill of noise on the flightline every afternoon! Flying Car and a Jet Man… One of the neatest things we saw was the Terrafugia Transition (flying car) do its thing in public for the first time. It rolled out on its own power, unfolded the wings and took off to do a nice aerial display… then it landed, folded up its wings and drove off… pretty cool! The “Jet Man”, Yves Rossy, was interesting enough, but watching something 6,000 feet over your head that didn’t even make much noise left a lot to be desired. One of the “sleeper” displays of the week was the SubSonex single person V-tailed jet by Sonex Aircraft. I’m not sure how you would insure it, but with a $10,000 deposit you could reserve a production slot on this $125,000+ single seater to be delivered next year. IA, New State… On the trip up to Oshkosh, we made a fuel stop in Dubuque, IA (KDBQ) and parked next to a familiar P-51 Mustang and our friend from home, Dan Fordice. Dan offered us lunch with the T-6 group that had been training there all week as he fired up “Charlotte’s Chariot” to beat the weather into KOSH. After a quick bite and some fuel we managed to get out in front of the long line of T-6’s as they formed up and headed north. After looking at my log when we returned, I realized that Iowa was a new state for our “land in all states adventure” – number 17 – a long way from all 49, but we are getting there! Next Year?… you bet, we plan to be there. Where else can you spend a week in a tent with 10’s of thousands of propheads like ourselves that traveled across this beautiful country of ours to the aviation Mecca, OSHKOSH! And as always… You can subscribe to our blog by entering your e-mail address in the “Follow” box to the right or “LIKE” our Face book page at https://www.facebook.com/2FlyAmerica. 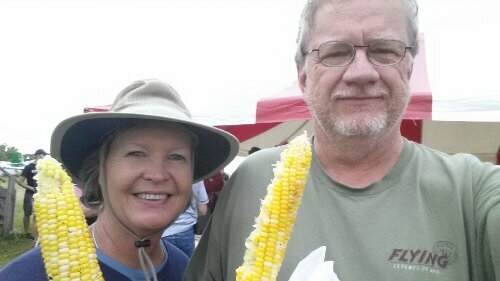 Oshkosh Day Three, Corn Roast! The weather couldn’t be any better here this week, highs in the mid 70s and no real rain yet. We have walked a lot and still only covered a portion of the show. The pedometer on my phone has me at over 20,000 steps Per Day since we have been here. We partied with the warbird group last night at SwampFest, thanks to Dan Fordice and crew and just finished some great roasted corn at homebuilt camping (only in Wisconsin). At 8:00 tonight is the mid week night airshow… Probably the best event here! 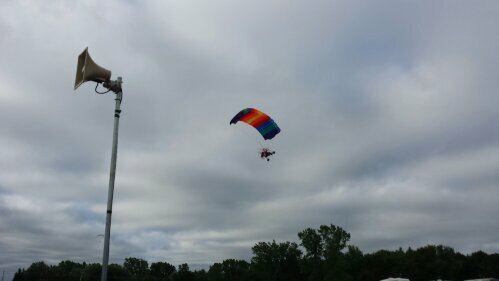 Half way through Airventure and all things are well in Oshkosh! Oshkosh Day One – Best Porta-Potti Day! from the nearby warbird camping at 0630. Temperatures are in the mid 50s and the Porta-Pottis are in the best shape they will be all week! With the smell of coffee in the air at the homebuilt camping area, we stopped for a cup and headed to see the powered parachutes at the ultralight area before the winds pick up. 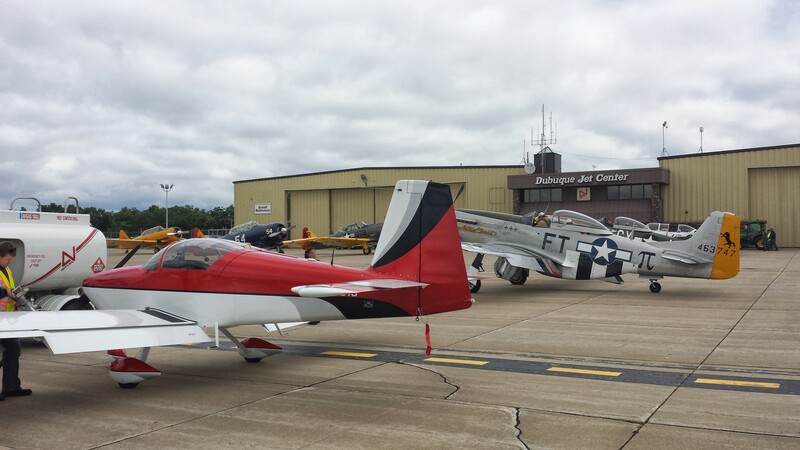 The P51s are cranked and the Aeroshell T-6s are in the air, let the show begin! TheoGreat video and commentary Paul and Beth, thanks. Enterprise Rent-a-Car "We'll Pick You UP"... just not at an airport! LaAviator.com – Your Source for Louisiana Aviation Information.